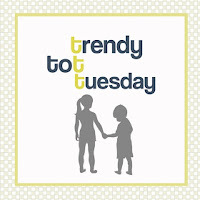 I am linking up with Kelly, Megan, and Lindsay for Trendy Tot Tuesday! I have been MIA for a few weeks, but it was for a really good reason! I figured it was time to get back in the swing of things! Dylan and Lexie had their first day of school on August 26th. This year, I gave them guidelines, but let them pick their own first day of school outfits. I really like what they chose! Lily is an awesome big sister, and wears her Big Sis shirt with pride! She adores her baby brother, and has been wanting to wear her first big sis shirt all the time! I was so excited to put Liam in the first outfit that I bought in case I had a boy. Everybody thought I was going to have a girl, so hearing "It's a BOY!" was very surprising! He was 4 days old when he wore it, and was around 7 lbs. He still had his chubby cheeks! Shortly after, he dropped down to the 5 lb range, and now, at 3 weeks old, is 6 lbs 2.6 oz. At least he will be able to wear it until summer ends. I'm so excited to be able to dress a baby boy again! As always, cutie kids I love! Aww! I love the first boy outfit you selected for Liam! And Liliana looks so proud in her big sis shirt! They are all so adorable!!! That are all so adorable!!! Goodness...they are all adorable. Love Liam's romper. And his cheeks. I want to squish them!